What Are the Signs That You May Need a Cervical Disc Doctor? - Stephen P. Courtney, M.D. Practicing medicine in Plano since 1995! What Are the Signs That You May Need a Cervical Disc Doctor? The cervical spine is in your neck. It is not uncommon to experience problems in this area. When they do occur, it is important to have them promptly evaluated by a cervical disc doctor like Dr. Stephen Courtney. Learning more about this area of the spine, the signs of disc injuries and possible treatments also ensures that you are informed. There are six discs in the cervical spine. They sit between the vertebrae, providing shock absorption. This makes it possible for the neck to handle the stresses of everyday living and injuries. There are also nerve roots. 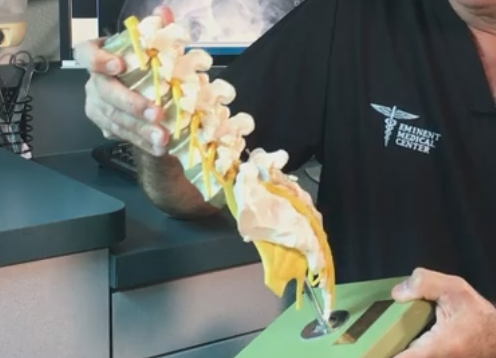 When a cervical disc is injured or experiences degeneration, it is possible for the nucleus of the disc to essentially leak out and put pressure on the nerve roots. This can cause an array of symptoms. The highest incidence of herniated discs occurs in people 35 to 55 years old. Men tend to experience this issue more than women. However, people of all ages are at risk for herniated cervical discs. When you have a problem with the discs in your cervical spine, a few days of rest might be recommended. Your doctor will let you know how long you should expect to rest. They might also prescribe gentle exercises to prevent your neck’s muscles and joints from getting too stiff. Nonsteroidal anti-inflammatory drugs might be recommended. These help to alleviate pain, as well as the inflammation that can cause swelling. The dosage and administration frequency will be provided by your doctor. If the conservative measures do not alleviate your symptoms, your doctor might recommend injecting steroids directly into the facet joints in your cervical spine. These injections place a small amount of a steroid medication and/or a numbing medication into the facet joint. The purpose is to help block pain. The injection is typically done with fluoroscopy, allowing the doctor to see exactly where the needle is going. Once it is in place, the medicine is injected. Patients may receive sedation, but this procedure is typically done without it. If you believe your neck might be injured, it is important to see a cervical disc doctor like Dr. Stephen Courtney without hesitation. They will examine your neck, determine the cause and help you to develop an effective treatment plan. Call 972-499-5457 to schedule a neck or back consultation with one of the best orthopedic spine surgeons, Dr Courtney. What does it take to be a good Orthopedic spine surgeon? 2019 courtneymd.com. All rights reserved.